Can the DEA get the job done? Has the Narcos TV show been cancelled or renewed for a fourth season on Netflix? 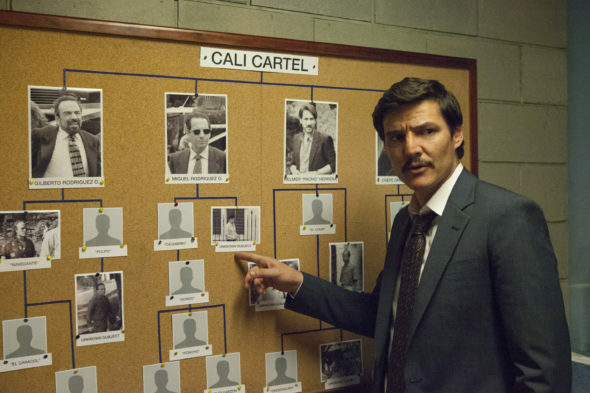 The television vulture is watching all the latest TV cancellation and renewal news, so this page is the place to track the status of Narcos season four. Bookmark it, or subscribe for the latest updates. Remember, the television vulture is watching your shows. Are you? Streaming on the Netflix paid subscription platform, Narcos stars Pedro Pascal, Alberto Ammann, Damian Alcazar, Eric Lange, Juan Pablo Shuk, Francisco Deni, Pêpê Rapazote, Javier Cámara, Andrea Londo, Kerry Bishé, Michael Stahl-David, Matt Whelan, and Arturo Castro. The crime drama follows the DEA as it investigates drug gangs, including the Escobar and Cali cartels. On September 6, 2016, Narcos was renewed for a fourth season. Stay tuned for further updates. Since Netflix already renewed it through season four, we don’t have to worry whether Narcos is cancelled or renewed for the near future. Since Nielsen doesn’t track streaming platform ratings, it is tricky to gauge this TV show’s performance, unless Netflix publicizes its success. For now, I’ll keep an eye out for any new developments and update this page as they break. Subscribe for free updates on any Narcos cancellation or renewal news. Find more Narcos TV series news or other Netflix TV show news. What do you think? Are you happy Netflix renewed its Narcos TV series for a fourth season? How would you feel, had they cancelled it, instead? More about: Narcos, Narcos: canceled or renewed?, Narcos: Mexico, Narcos: Mexico: canceled or renewed?, Narcos: ratings, Netflix TV shows: canceled or renewed? Peaky Blinders: Cancelled or Renewed for Season Five on Netflix? Master of None: Is the Netflix TV Show Cancelled or Renewed for Season Three?